What Do Candidates Look for While Selecting a B-School? Over 15,000 schools offer business degree programs worldwide. A majority of the institutions including the educators and practitioners believe that they clearly understand and address the expectations of any current or prospective student that intends to enroll with them. This belief is flawed and contradictory since there is significant divergence between students' expectations and the ground reality after the student enrolls for the program. This chapter aims to outline key deciding criteria that may enable a prospective candidate to assess schools before application. The factors include, but are not limited to, drawing up a list of potential schools, shortlist the “top” schools matching the offered programs and aspirations, future career path desired, amongst other important parameters such as diversity, class profile, and financial investment. 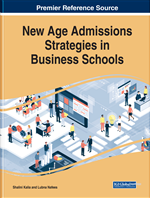 The factors discussed also highlight the key areas where business schools can meet and exceed expectations and go the extra mile that will help them differentiate against competition. It has been rightly said that business is everything. It is the basis of everything we do and how a society operates. Therefore, getting a business degree like MBA is critical, even if someone wants to open up a non-profit for social benefits or open a chain of restaurants. It is paramount to know the fundamentals of business education like finance, economics and marketing for any idea to be successful. The MBA is probably one of the most recognized degrees or qualifications in the world. The main objective of an MBA program is to create future business leaders/ managers. The first MBA program was instituted more than a century ago in the United States while in Europe, the first MBA program was offered in the United Kingdom in the early 1960s (Today, NA). Today, approximately 14,000 schools offer business degree programs worldwide with over 700 schools in US and Europe alone (Statista, 2016). The number of programs offered across Europe has spurted in the past decade with UK offering the maximum choices (Bedi, 2018), followed by Spain, France, Italy and the Netherlands. A significant contribution to this sudden increase in number of business schools worldwide can be attributed to the fact that a large majority of candidates are now opting to move abroad from their origin for pursuing a business masters’ education. UNESCO’s 2009 national conference on higher education report indicated an approx. 2.5 million students living abroad for purposes of higher education which is expected to almost treble(6.9 million) by 2020 (OECD, 2010). Of these numbers, approx. 43% or 3 million students chose 10 countries only as their destination for higher studies. United States topped the list with almost 1 million students reaching its shores while the UK came in a distant second with about 501,000 students arriving in Britain (Mitchell, 2018) up by 3.4% and 0.9% respectively (IIE, 2017). Considering only the USA, the major intake of students arrived from China and India with 750,000 and 400,000 students applying to enrol for higher education (Choudaha, 2012). Further breakdown of these numbers show that approx. 20% students are enrolled each in business programs and engineering courses (IIE, 2017). The enrolment numbers when translated to economic impact account for a huge chunk of the gross domestic product for these preferred destinations. In the United States alone, international students accounted for approx. USD 26.8 Billion to the state economy and 340,000 jobs added (Mcdaniel, 2014). Similarly huge economic impact is also observed across the Atlantic in the United Kingdom adding GBP 10.8 billion to the UK exports’ income (UniversitiesUK, 2017). Aging demographic looking for newer employment and education opportunities. Increased automation in industry leading to labour market shifts. Skills Gap: Difference between skills demand and supply. Restricted global movement: Barriers in movement to higher income countries and regions. Emerging markets and global dependence for economic growth. Demand in emerging economies vs. supply in developed world – imbalance. Lesser and lesser spend on education in public funding and government budgets. Urbanisation: Rapid movement from rural areas to cities in search of education and employment. Case Study: It is defined as a particular instance of something used or analyzed in order to illustrate a thesis or principle. Megatrend: An important shift in the progress of a society or of any other particular field or activity; any major movement. Accreditation: It is defined as the quality assurance process assessing the services and operations of educational institution and/or programs by an external authority. Smorgasbord: Referring to a wide variety of options/choices. Pedagogy: The method and practice of teaching, referring to a subject or concept. Infographic: Graphic visual representation of information, data or knowledge or a mix of all. Demographic: Term related to structure of population (i.e., young/old, male/female, etc. ).